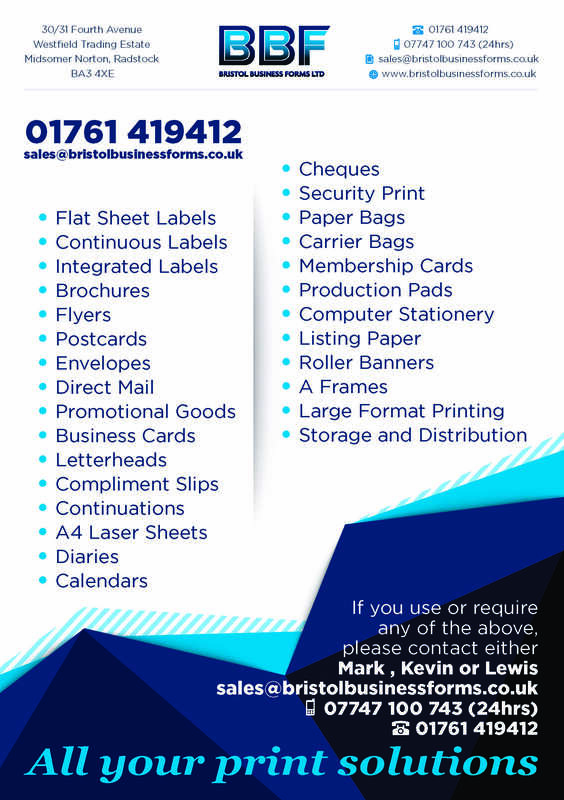 BBF are one of the West Country’s most successful and respected print providers. We have been trading in excess of 30 years and are proud of our fantastic reputation with both Customers and Suppliers alike. The Company was founded by Ian Philpott in the late 70’s, initially trading from Keynsham High Street and then moving to the edge of Keynsham next to the park. The Bristol Business Forms sign standing proud on the side of the office next to Andrews Estate agencies head office. In 2009 due to poor health and nearing retirement age Ian decided to retire, at the same time Mark Brooks the current owner, was being made redundant from his employer of 20 years. Having known each other for many years an agreement for the purchase of the business was struck and Mark took over the reins on 1st January 2010. Mark has over 36 years of print experience since 1977. Starting work for the Standard Check Book Company who were one of the first “Trade Only” suppliers of Computer Stationery he stayed with them until 1990 when he joined a Bristol based print broker, being made redundant from them in 2009 when the Company was sold. His experiences both in print manufacturing and sales gives him a vast knowledge of all areas of print, from the simplest of Business Cards through to the most complex of Direct Mail Campaigns.